You know when you try something new with your students, unsure of how it will go, and then they blow you away with how well they do? That's exactly how scavenger hunts have gone in my Pre-K classroom. They are my new favorite activity to do with students! It gets them up and moving, and working together. The first time we attempted a scavenger hunt, I was sure it was going to be a disaster. I put the kids in pairs, showed them how to check things off their list, and turned them loose with a clipboard and a pen. Then I waited for mass chaos to ensue...and it didn't. Maybe it was because they felt grown up using pens and clip boards, maybe it was because they were able to use some critical thinking skills, or maybe it was because they felt I trusted them and rose to the occasion--whatever the reason, my students worked hard! They synergized and found all of the items on their lists, very methodically checking off items. It was the cutest thing ever, and definitely one of those "this is why I teach" moments. Since that initial success, I have made scavenger hunts to target many different skills. I have a scavenger hunt for colors, 2D shapes, 3D shapes, textures, beginning sounds, rhyming words, and functional pairs. They provide a great way for students to demonstrate understanding of a topic, and, just as importantly, the kids love them! Yes, the kids need a little guidance as most of them are not yet able to read the words, but there are picture clues on the sheets to help out. The visuals on the page really assist them in completing the activity more independently. Additionally, the words used in the beginning sounds and rhyming hunts are all sight words or simple CVC words, so some students are able to complete them all on their own, depending on their level. My students who need a little more help check in with me when they are ready to search for their next item, then go off on their own to find it. That gives me the chance to make sure they are on track as they go, but gives them the freedom to show what they know. And they know a lot more than we sometimes give them credit for! 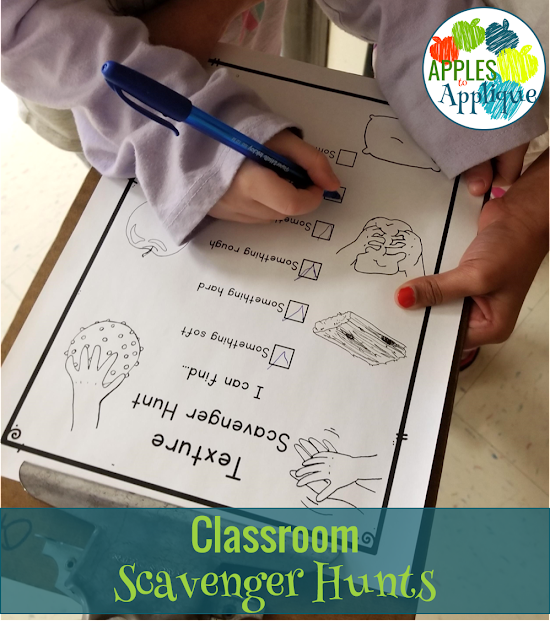 Get your scavenger hunts here, and enjoy watching your little learners show off their skills!